You are reading the Do I Look Stupid? Terms of Service, meaning the contract between you and Do I Look Stupid? when you use the Do I Look Stupid? site, services and products. You should read this carefully before you use Do I Look Stupid? If you have any questions or suggestions, feel free to e-mail us at doilookstupid99@gmail.com. Do I Look Stupid? is a site that has been developed to present common mistakes that people make in various aspects of their lives. It will also provide tips, advice and information on various subjects. Do I Look Stupid? may also sell merchandise, books, memberships etc. through the site. Members are most welcome to write articles or post videos on Do I Look Stupid? However, we will not post photographs provided by members until and unless they can guarantee that they hold the requisite copyright to the photographs. Do I Look Stupid?? reserves the right to filter any content posted by members and remove objectionable posts without notice. Do I Look Stupid? may also cancel accounts of users who violate the Terms of Service. Do I Look Stupid? reserves the right to edit and make changes to posts and articles submitted by you that we feel are appropriate without notifying you. If you have any objections to the editing or the changes made, you could request for a withdrawal of your post/article by sending us a mail at doilookstupid99@gmail.com. 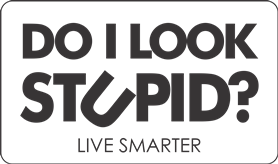 Most articles/posts on Do I Look Stupid?, whether written by our writers or by members, may be accompanied by a photograph/visual and recommendations on books/videos/music albums etc. These would be chosen at the sole discretion of Do I Look Stupid? and members would not have any say in the matter. If a member desires, he/she could recommend photographs/visuals/books/videos/music albums etc. that he/she would like to associate with his/her article. However, the final call on this would remain with Do I Look Stupid? If the member has any objections to the photographs/visuals/books/videos/music albums etc. attached by Do I Look Stupid? with his/her post/article, he/she could request for a withdrawal of his/her post/article by sending us a mail at doilookstupid99@gmail.com. As a user of Do I Look Stupid?, you are solely responsible for your own submissions. By transmitting your submissions to the website or otherwise through or by using Do I Look Stupid? you represent that you have all rights and authorizations necessary to post, submit, display, produce, or otherwise transmit, such content (text, software, data, images, graphics, photos, audio, audiovisual, videos, and content of any nature). You agree that you will not submit material that is or contains the intellectual property of a third party that you do not have permission to use. You shall retain all of your ownership rights in your submissions; however, by submitting material to Do I Look Stupid? you grant Do I Look Stupid? full transferable rights to use, reproduce, distribute, modify, transmit, prepare derivative works of, display and produce the material in connection with Do I Look Stupid? and Do I Look Stupid? business. To the extent you do not have ownership rights to any of your submissions, you shall indemnify Do I Look Stupid? for any claims regarding Do I Look Stupid? use of your submissions. When using Do I Look Stupid?, you may be exposed to submissions from a variety of sources, and Do I Look Stupid? is not responsible for the accuracy, usefulness, safety, or intellectual property rights of or relating to such submissions, which may be inaccurate, infringing, offensive, indecent, or objectionable. You understand that all information publicly posted or privately transmitted through Do I Look Stupid? is the sole responsibility of the person from which such content originated and that we are not and will not be liable for any errors or omissions in any content. You understand that we cannot guarantee the identity of any other users with whom you may interact in the course of using Do I Look Stupid?. Additionally, we cannot and do not guarantee the authenticity or accuracy of any data that users may provide about themselves or relationships they may describe. Crawl content without permission from Do I Look Stupid? Use Do I Look Stupid? for file sharing. Link to files on Do I Look Stupid? without a link to the original post. Do I Look Stupid? reserves the right to ban sites and users that do not comply with our terms of service. Users may not be notified when this occurs. Banned users may e-mail us at doilookstupid99@gmail.com for more information. Please comply with the rules above. While we have the right to monitor activity and content associated with Do I Look Stupid?, we are not obligated to do so. We do not guarantee the accuracy, integrity or quality of any content on Do I Look Stupid? Because community standards vary and individuals sometimes choose not to comply with our policies and practices, in the process of using DILS, you may be exposed to content that you find offensive or objectionable. You can contact us at doilookstupid99@gmail.com to let us know of content that you find objectionable. We may investigate the complaints and violations of our policies that come to our attention and may take any action that we believe is appropriate, including, but not limited to issuing warnings, removing the content or terminating accounts and/or subscriptions. We also, however, reserve the right not to take any action. Under no circumstances will we be liable in any way for any content, including, but not limited to any errors or omissions in any content, or any loss or damage of any kind incurred as a result of the use of, access to, or denial of access to any content on the Website. The content posted by Do I Look Stupid? would be original in nature although some points and aspects could have been borrowed from other sources. If content, photographs etc. have been borrowed from any source, Do I Look Stupid? would, as far as it knows, acknowledge the source. If it comes to light that content of any kind on Do I Look Stupid? has been taken without permission or without acknowledging the original source, Do I Look Stupid? would not be held liable in any way. It would, however, immediately remove such content from its website. IT IS EXPRESSLY UNDERSTOOD THAT WE SHALL NOT BE LIABLE FOR ANY DIRECT, INDIRECT, INCIDENTAL, SPECIAL, CONSEQUENTIAL OR EXEMPLARY DAMAGES, INCLUDING BUT NOT LIMITED TO, DAMAGES FOR LOSS OF PROFITS, GOODWILL, USE, DATA OR OTHER INTANGIBLE LOSSES (EVEN IF WE HAVE BEEN ADVISED OF THE POSSIBILITY OF SUCH DAMAGES). SOME JURISDICTIONS DO NOT ALLOW THE EXCLUSION OF THE LIMITATION OR EXCLUSION OF LIABILITY FOR INCIDENTAL OR CONSEQUENTIAL DAMAGES. ACCORDINGLY, SOME OF THE ABOVE LIMITATIONS MAY NOT APPLY TO YOU. IN NO EVENT WILL OUR TOTAL CUMULATIVE LIABILITY EXCEED RS. 100,000. Should you have other questions or concerns about these terms of service, please send us e-mail at doilookstupid99@gmail.com.